Hearing that the 35.8m motor yacht Squalo has been sold, I call her listing agent, Ksenia Demidova at Topyachts in The Ukraine, who confirms the deal is done with Cesar Abi Akl at Sailing Plus acting for the buyer. 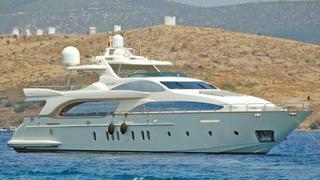 Squalo is an Azimut 116 built in 2005 to a design by Stefano Righini and is RINA classed. Her interior, by Carlo Galeazzi, comfortably sleeps 10 guests in five double cabins, all with en-suite facilities and twin 2,000hp MTU engines and efficient planing hull deliver a maximum speed of 25 knots. Squalo also offers plenty of light and space throughout. The full beam mid-ships owner’s cabin has large through hull windows that fill the area with lots of natural light and the long run of the flybridge is ideal for lovers of the sun. There is also more space for relaxing in the cockpit area, with a large table seating twelve.